The principles of brain-based learning acknowledge that not all memories form properly. Some never form enough for retention and some form poorly and can only be vaguely recalled. Still others retain in a vivid format, are easily recalled, and when recalled seem as fresh as the day the memory was retained. Some memories are enhanced through experience and repetition. For example, the heat that arises from a stovetop or the successful playing of a piano provides vivid memories and automated responses. We know from experience that we each can develop strategies to make memories stronger and our emotional state at the learning point can have a great influence at how the memory is stored. Memories can become so strong that they actually associate with a reflex action. Concentration and lack of distraction also affect learning and memory retention. These, in essence, are among the principles of brain-based learning that have allowed us to formalize strategies to enhance learning and repeat those tactics and strategies for the benefit of all students. You can find a discussion of all the brain-based learning principles behind this impressive method of teaching on our website. Who gets to try it first? The challenges involved in brain-based learning come from people who are late to make changes in what they currently know and practice. When an innovation comes to fruition, people usually will respond in one of four ways: innovators will be the first to try anything new and are always looking for better ways to do things; early adopters will wait to see if innovation 1.0 has merit and then will make the switch to test their own experience; third, late adopters will come around once successes have been demonstrated, documented, and accepted—then they will make the switch to evaluate; and fourth, resisters simply are resistant to any change and experience too much comfort in their own created comfort zones. They may finally adopt new things, in part, or continue on their established path. We, ourselves, are innovators. We actively seek new approaches and hone them until they work or abandon them and move on. However, brain-based learning is reaching to the late-adopters and resistors segments, simply because the scientific basis has been shown, the research completed, and the practice demonstrates and verifies greater achievement. Brain-based learning has reached the point where it is time to adopt the principles and strategies into your own methods and allow students to benefit from more effective learning and higher achievement. The critics will always be there, and you can review what has been discussed and the responses to the critics’ points on our website. The research into the challenges involved in brain-based learning is extensive, and so is the proof of how well it works. Take the time to review the research and become familiar with the positive experiences of those who have tried the method and seen the results. 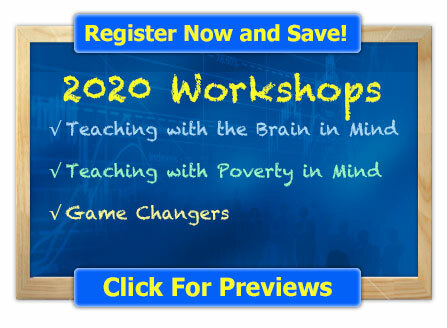 To learn more about brain-based learning and to learn how to adopt the benefits of it into your own learning and teaching, Jensen Learning presents a four-day, Teaching with the Brain in Mind workshop that can change your life. We can also adapt the workshops to shorter versions that can be delivered on your own campus in the time available. 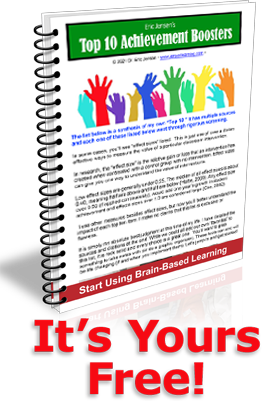 Additionally, our PowerPoint presentations on brain-based learning can be purchased, downloaded, and used in developing your own staff development session on these unique and easy-to-use strategies. There are several on various special applications and at least one of them will be just right for you.